NTU is the top ranking University by scientific paper performance in Taiwan and ranked the 161th in the world. Currently the University consists of 11 colleges, 54 departments, 96 graduate institutes and 4 research centers and offers diplomas in over 100 fields of study. 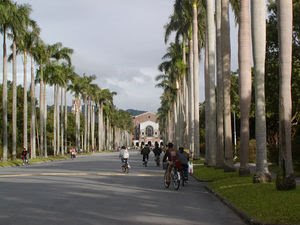 The entrance examination score requirements to enter NTU is typically the highest among universities in Taiwan, and NTU is widely considered the best and most prestigious university in Taiwan. NTU has very strong ties with Academia Sinica. NTU admits students based solely on merits, disregarding other factors such as race, religion, or gender. The female-to-male ratio in the undergraduate population is about 0.9:1. Many influential individuals in Taiwan society received their education at NTU, including government officials in both pan-blue and pan-green camps. The predecessor of National Taiwan University was Taihoku (Taipei) Imperial University, founded by the Japanese in 1928. The first president was Dr. Shidehara Tan Tairaka Hiroshi. When Taihoku University was first established, it had two colleges: the College of Liberal Arts and Law, and the College of Science and Agriculture, and had a combined total of 60 students. The College of Medicine and the College of Engineering were added in 1936 and 1943 respectively. The College of Science and Agriculture was also divided into two colleges in 1943: the college of Science, and the college of Agriculture. The college of Agriculture was divided into three sections: the College of Agriculture and Forestry, the College of Medicine, and the Graduate Institute of Tropical Medicine. During Taihoku Imperial University period, every college consisted of "lectures", which were conducted by a professor and included assistant professors, assistants, instructors and office employees. In 1945, the five colleges had 114 lectures with 382 students. The College of Liberal Arts and Law had 25 lectures, the College of Medicine had 24, the College of Science had 13, the College of Agriculture had 22, and the College of Engineering had 30. After World War II and Taiwan's retrocession to Chinese Sovereignty, the R.O.C. government resumed the administration of Taihoku University and reorganized and renamed it ''National Taiwan University'' on November 15, 1945, with Dr. Lo Tsung-lo serving as the first president. The College of Liberal Arts and Law was divided into two colleges: the College of Liberal Arts and the College of Law. The University thus consisted of six colleges (Liberal Arts, Law, Science, Medicine, Engineering, and Agriculture) and had twenty-two departments with 500 odd students. The Evening Division, the College of Management, the College of Public Health, and the College of Electrical Engineering (renamed as the College of Electrical Engineering and Computer Science in 2000) were established respectively in 1967, 1987, 1993, and 1997. In 1999, the College of Social Sciences replaced the College of Law, and the Department of Law was upgraded to become the College of Law. The evening division and the Center of Continuing Education were also combined into the Division of Continuing Education & Professional Development. In 2002, the College of Agriculture was renamed the College of Bio-Resources and Agriculture. In 2003, the College of Life Science was established. As of the 2004 academic year, the University has a total of eleven colleges, 54 departments, 96 graduate institutes (which offer 96 Master's programs and 83 doctoral programs), and four research centers: the Division of Population and Gender Studies, the Center for Condensed Matter Sciences, the Center for Biotechnology, Japanese Research Center, and the Biodiversity Center. The number of students reached 29,877 in 2004, including the students from the division of Continuing Education & Professional development. A new library was built in 1998, and now contains over 3,000,000 volumes of books. The president heads the university. Each college is headed by a dean, and each department by a chairman. Students elect their own representatives each year to attend administrative meetings. The International Chinese Language Program (ICLP), founded by Stanford University, is located at National Taiwan University.